Has broken his clothes can be referred for repair in the workshop or just throw it away. However, before you try to put it in order yourself. Small holes and cuts are eliminated quickly and quietly. Only need to purchase a device for darning, suitable needle and thread and learn some simple sewing techniques. Get a basic sewing kit. 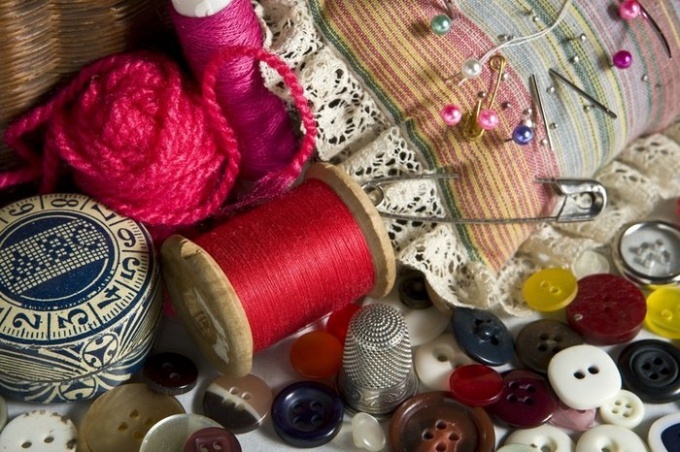 You will need a set of threads of different thickness and structure, needles, a wooden mushroom for darning, which can be replaced with a light bulb or a special device for darning with mounted lights. This files most often have to sew socks, tights, stockings and other casual knitwear. Finding a hole in the sock, pick up yarn for mending – they are more voluminous and soft. Choose the right color, turn the sock inside out, stretch it on a wooden mushroom or light bulb and start mending. For starters, trim with sharp scissors sticking thread. Walk the seam "forward a needle" on the perimeter of the hole, retreating from the edges of 2-3 mm. Slightly pull the thread, preobra fabric. Secure the seam, a few small stitches. Make parallel stitches from one end of the hole to the other so that the thread passed through the hole. Start small darning stitches, grabbing the edge of the fabric and laid threads. Take needle from one end of the needle to the other and back. So how sew rows, placing one row of stitches on top of each other. Make sure that the density of the darning did not exceed the thickness of the fabric itself. Do not close the seam, the stitches must lie freely. Tights and stockings are sewn differently. Choose thin synthetic thread in the color of the canvas. Straighten damaged stocking darning mushroom, find a flat loop, pick up her needle and secure with several small stitches. Do this with all the detected loops. If this is not done, a hole, or "arrow" will increase. The small holes you can simply pull, making several tight stitches through the hole. Then lock the seam by making several small stitches in one place and tying the string knot. "Arrow" close, laying small slanting stitches through it and pulling the thread. Do not pull too hard, the seam should not pucker and gather in folds. Similarly, you can sew and knit – a scarf, mittens or sweater. For chunky knit will need a thick thread and matching needle with blunt tip (e.g., embroidery). Great choice – the thread of which is connected to the product. Sewing up the cuts on the fabric, use another method. Straighten the damaged area, pass the needle thread of the appropriate color and make a cut along a row of small stitches seam "forward needle". This way you will lock the edge of the fabric and prevent it shedding. As you work with the wrong side of things from time to time inspect the front side, checking how it will look like a seam. Make happy small stitches perpendicular to the cut, not pulling the fabric. Stitches lay parallel to each other. Secure the seam and iron it with the iron. If the thread is chosen correctly, the seam will be almost invisible.